How have the states been doing on jobs and pay since the last business cycle peak? We’ve mapped some answers. 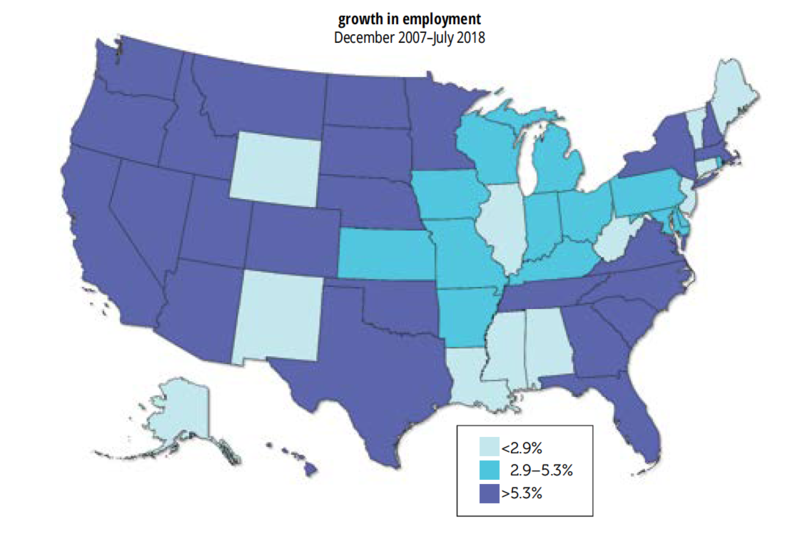 First E1, Employment: Between the last business cycle peak in December 2007 and July 2018, the most recent month available, the median state has seen a 5.3% increase in employment. At the top of the list is Utah, up 20.1%, with North Dakota and Texas close behind. Some of the bigger, richer states have done well, like California (up 10.8%) and New York (10.0%). So has Massachusetts, up 10.9%, a state that’s not thought of as a boomy place. 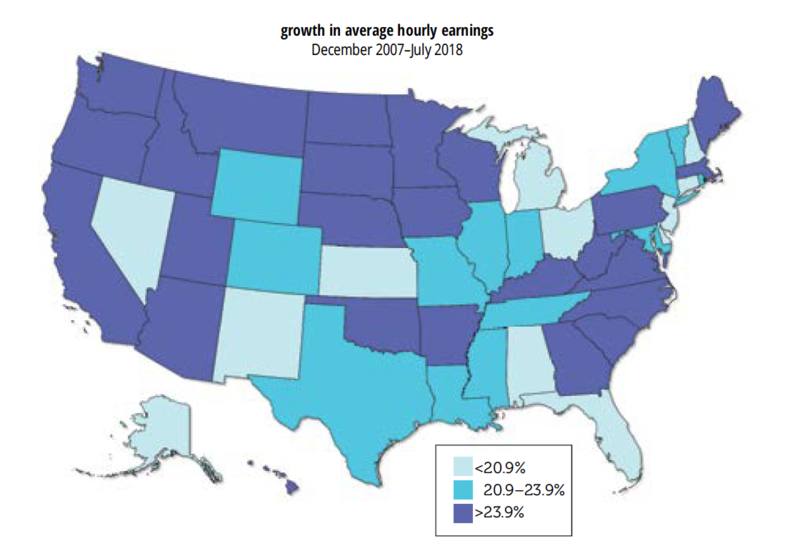 At the bottom: Wyoming (-2.6%), West Virginia, (-1.1%) New Mexico (-0.8%), and Connecticut (-0.5%), who’ve all lost jobs over the last decade-plus. Also weak: Mississippi (+0.3%), Alabama (also +0.3%), Maine (+1.3%), Louisiana (+2.7%), and New Jersey (+2.8%). Of the ten states with the largest energy sectors, five (Louisiana, Alaska, New Mexico, West Virginia, and Wyoming) are clustered in the bottom quarter, and a sixth, Oklahoma, is at the median. Two are closer to the top, Texas and Colorado, but they’re generally more diversified economies than the ones at the bottom. It’s interesting that while New York has done rather well, two of its neighboring states, Connecticut and New Jersey, haven’t. New York City accounted for 79% of the state’s employment gain over the period, nearly twice its share of the state job market. Were New York City a state, it would rank fifth in employment gains; New York State excluding the city would rank in the bottom third. This is a reversal of the trend of earlier decades when the urban core lagged its suburbs. For example, between 1990 and 2000, New York City’s employment gains were less than half that of the state outside the city. Second E2, Earnings: There’s a huge variation in growth in average hourly earnings (AHE). At the top of the list, North Dakota, up 42.9% between December 2007 and July 2018. Since it ranked second in employment growth, its workers have done very well, a reflection of the fracking boom. South Dakota is in second place, up 38.9%; Oklahoma, third (34.7%); and Iowa, fourth (32.9%). Four of the top ten states—South Dakota, Oklahoma, Montana, and West Virginia—are among the ten most energy-intensive. But other energy states did less well, with Texas (22.6%) just below the median of 23.9%, and Colorado (22.5%), Wyoming (21.7%), and Louisiana (also 21.7%) not far behind. California (25.0%) and New York (22.5%) are around the median. (There’s not much difference between New York City and State on earnings; the city’s AHE were up 24.7%.) Florida, Michigan, New Jersey, and Connecticut are all towards the bottom. Texas is an interesting case. While it’s often touted as a jobs mecca, it’s not notable for high pay. That’s not to say that keeping pay down is necessarily good for employment. The correlation coefficient between employment and earnings growth between 2007 and 2018 is 0.37—not super-high, but still solidly positive. Job and wage growth often go together. Alan Greenspan used to say that the fears concerning skill obsolescence & the corporate restructuring that took hold in the 1980s & 1990s had changed worker psychology. In this series we examine 5 pieces of underlying evidence. In the most recent Job Openings and Labor Turnover Survey (JOLTS) data, for July, job openings and hires were mostly unchanged from June, though manufacturing showed a nice uptick in both, as did accommodations and food services. Separations were little changed. Monthly changes can be distracting, so here’s a longer look at the openings component. At 4.7% of employment in July, private sector openings are at the high for the series, and July’s high matches April and June’s. The high before these recent numbers was the 4.2% in January 2001, as the late-1990s boom was unwinding, all visible on this graph. Openings look great, but what do they really mean? Well, for that, please see All About Jobs, 2: Should the unemployment rate actually be lower? We suspect that these are phantom job openings, a kind of tire-kicker index in which employers are hoping to land a really big fish, but not using very good bait. Looking at the Conference Board’s help wanted online (HWOL) series underscores the possibility that employers may not be that serious about these openings. Both versions of the HWOL series, new, unduplicated listings and total listings—have been trending downward for three years, while the openings rate has been working its way higher. If employers want to fill these jobs, why aren’t they advertising them? We first asked this question in October 2016 and last asked it in May, and the trends have only di-verged further with each asking. Anything else? Yes! All about Jobs, 4: Should the quit rate be higher? All about Jobs, 4: Should the Quit Rate Be Higher? 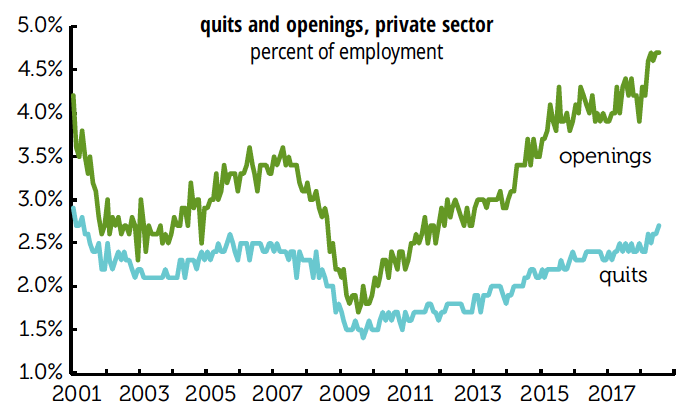 As this graph shows, the private sector quit rate is close to an all-time high for the series. Quits are a sign of worker confidence and can forecast wage pressures ahead. But as high as the quit rate looks, should it maybe be higher? To answer that question, it’d be nice to have a quit series that goes back before 2001. We don’t have an official one of those, but we can construct one by using the share of voluntary leavers among the unemployed and those unemployed five weeks or less. For the period since 2001, the synthetic quit rate has an r2 of 0.93 relative to the actual rate. Of course, things may have changed over time, but r2’s like that are rare in the world of economics, so we feel pretty confident that this is a good estimate of the pre-2001 history. And if we take that long-term synthetic series and compare it to the unemployment rate, we get the results graphed above. Instead of the July unemployment rate of 3.9%, the predicted rate should be considerably higher, 5.3%. In other words, workers are acting as if the jobless rate is almost a point-and-a-half higher than it is. 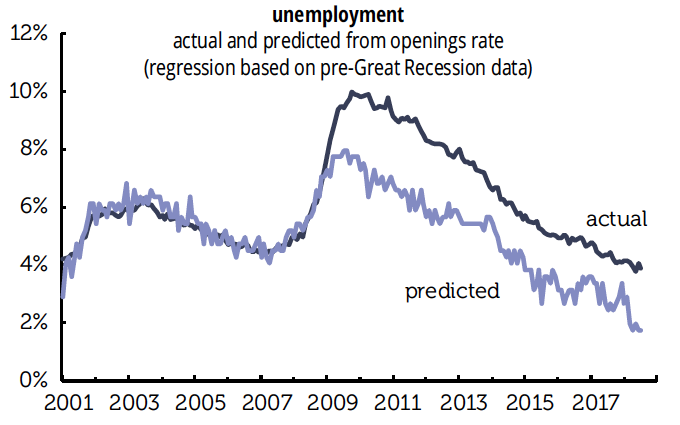 Note that the pattern was similar around previous unemployment troughs in 2000 and 2007. But before 2000 the reverse was true, as the predicted rate was higher than the actual. We suspect what’s at work is a phenomenon that Alan Greenspan used to talk about in the late 1990s: the fear of corporate restructuring and job skill obsolescence that took hold in the late 1980s/early 1990s has changed worker psychology. 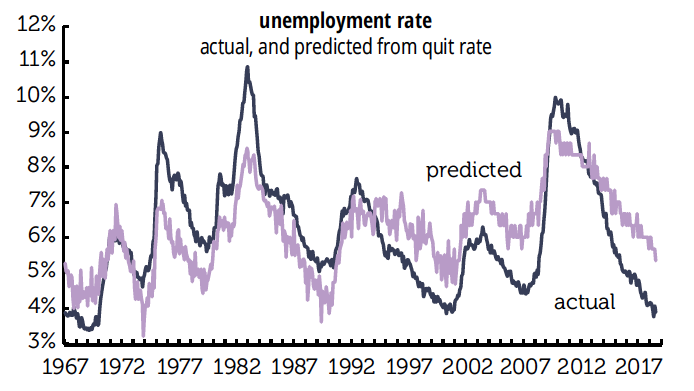 It takes a lower unemployment rate to give rise to enough confidence to quit than it did several decades ago. And finally, All about Jobs, 5: What about job leavers and wages?